Anyone who has ever spent time hiking in the Blue Mountains has undoubtedly paid a visit to the mountain peak known as "The Pinnacle". 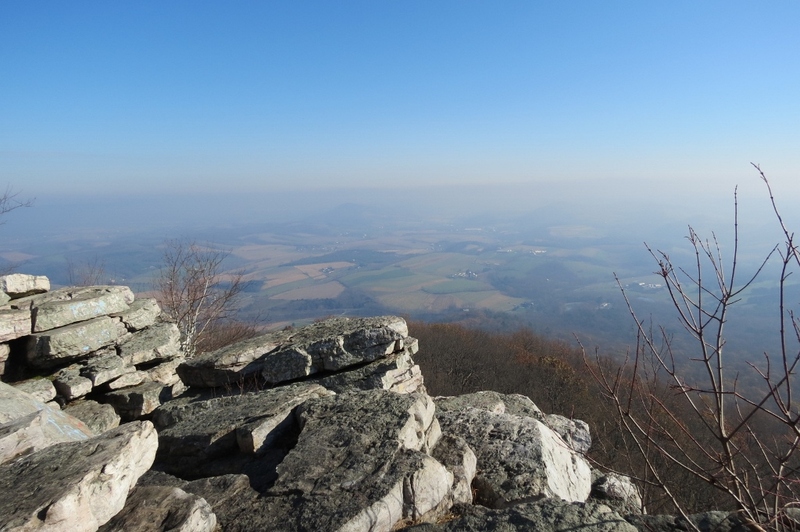 This craggy peak, the highest point in Berks County, has been known for centuries by many different names; to early Pennsylvania Dutch settlers it was known as "Zinne-kup" (or Zinne-kop), which, loosely translated, means "merlon head" (in medieval architecture, merlons are those crenelated tops of castles, giving them that distinctive castle-like appearance). 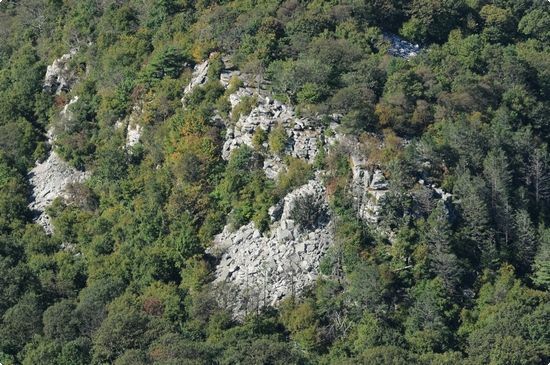 To the native Lenape, the boulder-capped summit was known as "Kanteele", or "battlement". With so much history attached to this unique geological feature, it only stands to reason that the Pinnacle is steeped in legend and myth. It has been said to have been the gathering place of witches, the site of ancient Indian human sacrifices and the home of restless, wandering ghosts. Many have claimed to have seen unexplained sights and to have heard unexplained sounds. Since the days of the earliest settlers, a faint, peculiar whistling or sighing noise has been heard atop the summit at night, and this unearthly sound can still be heard today. One of the oldest legends about the strange noises heard atop the Pinnacle has its roots in Lancaster County, which was the home of Revolutionary Era glassmaker Henry William Stiegel. 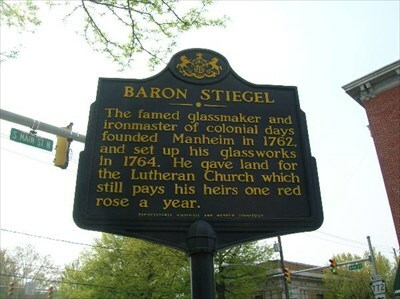 In addition to being America's greatest glassmaker, Baron Stiegel is also famous for founding the borough of Manheim in 1762. Stiegel was also a skilled ironmaster and the operator of several forges, including Charming Forge and Elizabeth Forge in Lancaster County, and the Tulpehocken Eisenhammer furnace in Berks County. And therein lies the origin of the legend of Baron Stiegel's glass airship. Stiegel was one of the few men of his time who believed in the future of aerial transportation. According to legend, in 1774 he built a zeppelin-like airship out of glass and launched it from Stuckbarrich, his mountaintop home near Waldeck, Lancaster County. The glass ship was piloted by two aviators, who were instructed by Stiegel to deliver a letter to his friend Sir William Johnson (who was the British Superintendent of Indian Affairs at the time) in the Province of New York. Legend states that a strong gust of wind blew the glass airship against the Pinnacle, smashing it into millions of jagged shards. The Baron's pioneering aeronauts were cut to ribbons, and their bones were picked dry by vultures atop the mountain. The strange sounds are said to be the restless spirits of Stiegel's unfortunate crew. Others have claimed that the sounds are produced by the spirits of white captives who were brutally murdered by Indians during the "Blauen Barrichen" raids of Berks County in 1755. Historical marker in the borough of Manheim, founded by Baron Stiegel in 1762. 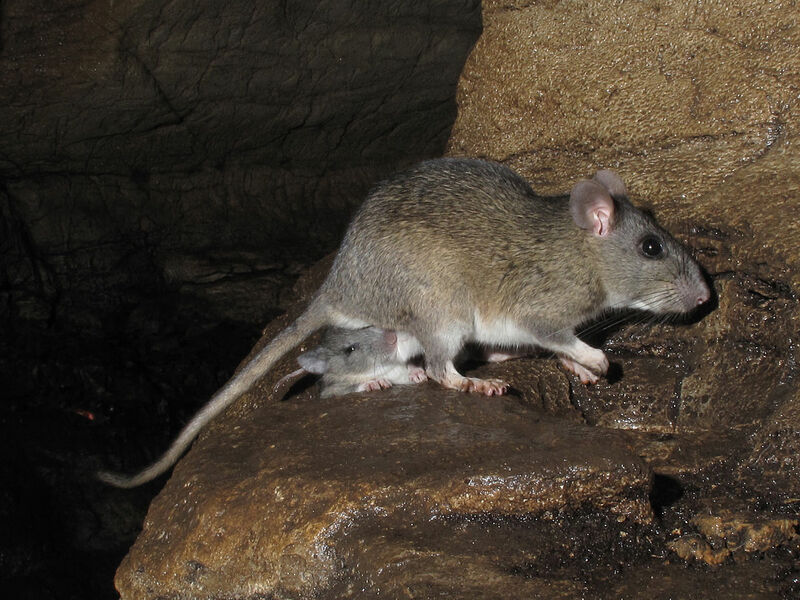 The peculiar sounds heard on the Pinnacle, as it turns out, have been traced not to spooks and phantoms, but a rare species of rodent-- the Blue Mountain cave rat. In the early 1930s, two researchers from the Reading Museum set out to solve the mystery of the bizarre sounds. Dr. Levi W. Mengel and Dr. Earl L. Poole spent time on top of the mountain at night and eventually discovered that the sounds were made by a species of rat that is found no other place in the world. The existence of the Blue Mountain cave rat had already been known for quite some time (Christopher Shearer, the famed Berks County landscape artist who often painted atop the Pinnacle, described the Blue Mountain cave rat in detail in 1916), but it was Dr. Poole who first linked the eerie sounds to the shaggy rodents. In 1931, Dr. Poole and a group of local Boy Scouts trapped several speciment and sent them to the Fairmount Park Zoological Garden in Philadelphia. Another local legend pertains to the cell-like structures made of sandstone that are located on the Pinnacle. 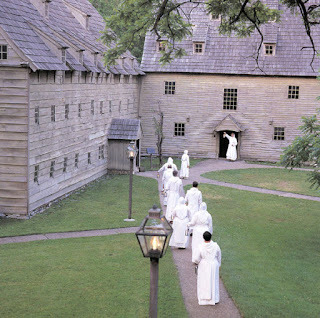 The story goes that a pair of nuns ran away from the Ephrata Cloister and found refuge in these shallow caves. These caves, known to the locals as the "Nunnen Lochs" (Nun's Cells) can still be seen today and are a popular spot for backpackers and hikers along the Appalachian Trail. In one version of the tale, the older nun bathed the younger nun every night in the icy waters of a spring near the summit to cleanse her of her "worldliness". A couple of berry-pickers encountered the two nuns, the younger half-frozen to death, and attempted to convince her to leave her cruel companion. The younger nun refused to leave the Pinnacle until her spiritual sister had succeeded in "washing away her worldly pride". One winter night, after the younger nun had received her icy bath and was returning to her rocky cell while wearing a white robe, she was shot and killed by frightened hunters who had mistaken her for a ghost. Since then, the apparition of the "Woman in White" is said to haunt the Pinnacle. In another version of the story, as told by iconic Pennsylvania folklorist Henry W. Shoemaker, the two nuns were revered as mystics by local Indians, who brought them gifts of furs and food. Then, one day, a Dutchman from New York by the name of Cornelius Eldert was hunting on the mountain and heard the sounds of weeping coming from a cave. He watched the young nun preparing for her ice bath and his heart broke when he heard the chattering of her teeth. He made up his mind to rescue the young nun. He waited until the older nun had fallen asleep and then dashed into the cave, forced a gag into the young woman's mouth, threw her over his shoulder like a sack of potatoes and scurried down the mountain. 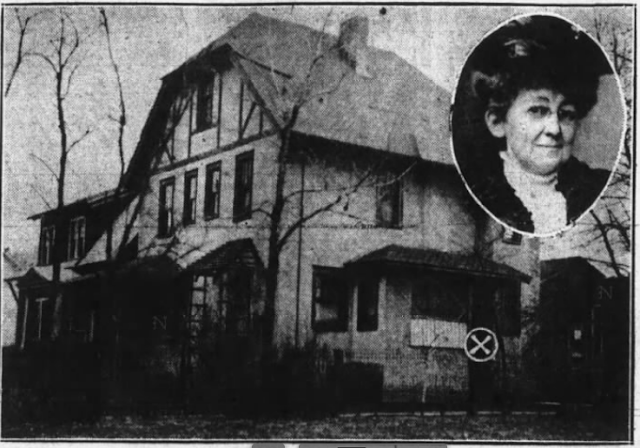 The older nun, it is said, later returned to Ephrata where she procured employment as a servant at the Sorrel House. According to some sources, when she returned to society after years of seclusion at Nunnen Lochs, it was observed that the former nun only had one foot-- her other foot was reportedly eaten by cave rats. Whether there is any truth to any of these legends it is impossible to say; however, some mythical individuals associated with the folklore of the Pinnacle really did exist. One such person was Daniel Ney, whose name figures prominently in many old time stories pertaining to the Blue Mountains. Born in 1832, Daniel Ney was an eccentric medicine man and farmer who made his home just west of the Pinnacle, where he lived with his wife and children. Healing was in Ney's blood; his father was a druggist in Shartlesville, and lived at a time when most country druggists crafted their own potions and salves from herbs and roots, and his brother became a prominent local physician. As young man, however, Daniel's first love was not medicine, but farming. He farmed for half a century, and at one point owned 320 acres in Oklahoma Territory and Nebraska. He decided to return to Berks County and retire from farming and, after returning to his boyhood home, rediscovered his love for medicinal plants and herbs. 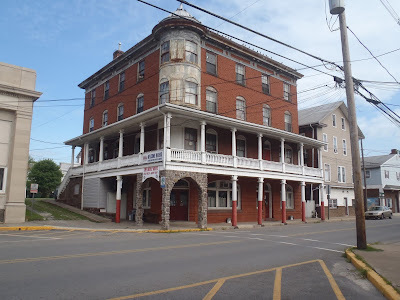 He also purchased a tavern, famous at the time for having a barroom that sat on the county line, with one end of the bar resting in Berks County and the other end of the bar in Schuylkill County. It was said that there was no bell on the door of the tavern; instead, Daniel kept a rattlesnake in a wooden box next to the entrance, whose rattles would alert him that he had a customer. The Ney family name was already famous throughout the region by the time Daniel returned to Pennsylvania; shortly after the Civil War, Daniel's father had patented a syrup known as "Ney's Infant Drops", which was sold throughout Pennsylvania. The Ney family was also famous for brewing a unique beverage known as Blue Mountain Tea, which was sold to lodgers at Ney's Tavern and was said to rival even the best teas from China and Japan in quality. By the early 20th century Daniel Ney was an old man of 80-odd years and had become a living legend of sorts. He was known for keeping a herd of mountain goats and for keeping a large colony of honey bees. He was also famous for rendering aid to any traveler or neighbor in need; he is credited with countless rescues of travelers whose carriages careened off the edge of the steep mountain roads or hunters who had become lost in a blizzard. Sadly, nothing is left of the historic Ney's Tavern. It was burned to the ground in the winter of 1923 by an arsonist. There is also a true story of a young girl escaping death at the hands of marauding Indians at the Pinnacle. During the 1700s a young girl from Albany Township named Maria Heil was kidnapped by a band of Lenape. As her captors led her over the rugged mountain she managed to break free and made her escape down the rocky slope of Zinne-kup. As she made her way down from the mountain she saw a wooden hunting blind high up in a giant white pine tree. She scrambled up the trunk and concealed herself among the branches while her kidnappers searched for her. For generations, "Maria's Pine" was pointed out by local woodsmen and hunters. According to Henry W. Shoemaker, the pine tree was still alive and well as late as 1940, though the exact location of the tree appears to have been lost to history. However, since white pines have been known to live as long as five hundred years, it's possible that this very tree still stands in the shadows of the Pinnacle.